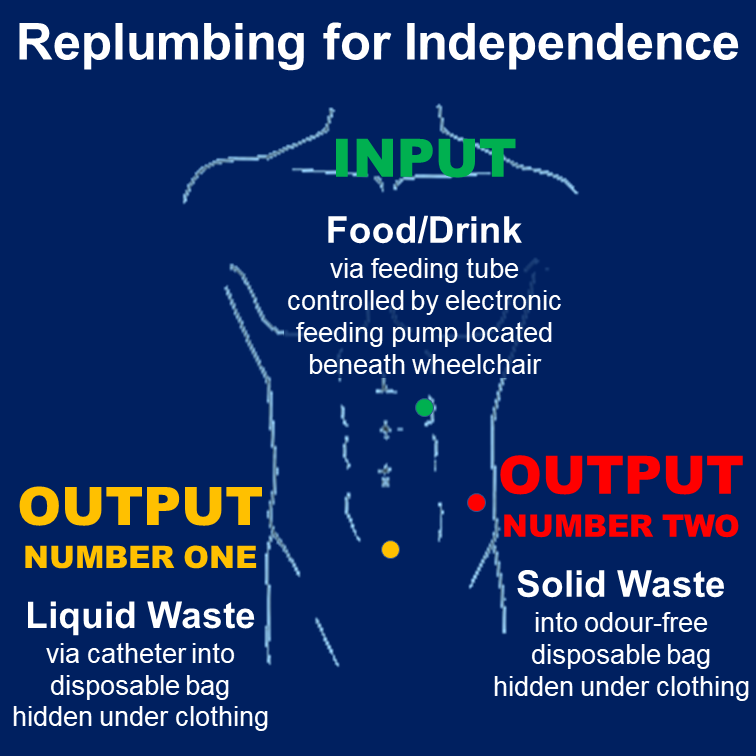 I am working with a cross-disciplinary network of surgeons, nurses, and clinical-care specialists to devise an optimal protocol that maximises the quality of life for eating and drinking and going to the bathroom once someone with MND can no longer feed themselves or toilet themselves. The default protocol for MND is: Depend on Carers. This is how it would (not) work for me. Carers, supposedly, would feed me. That is all very well, but I plan to be independent. What’s more, I love socialising with friends and family at restaurants, and I do not intend to slow down proceedings (let alone risk embarrassing them or myself in public) by someone having to feed me – with all the attendant dribbles and spills – as well as feed themselves. Carers, supposedly, would also toilet me. And leave me in an incontinence pad just to be safe. The logic being that MND does not usually cause incontinence, so for the rest of my life I can use the toilet like anyone else. After being hoisted into position. And off again, for cleaning. Really?!? And that is in no way unnecessarily humiliating? And what about later on when I am likely to be given courses of strong antibiotics and so maybe develop diarrhoea as a result? Will carers toilet me all day? Or simply leave me in my soiled pad until they return? To those of us now devising an alternative, the default MND protocol for feeding and toileting does not seem quite as humane as it could be. Click here to explore our solution in detail.